Sample questions for first midterm can be downloaded here. (Don't worry that it says February 2008 - its the same material.) This file is in pdf format- if you need a program to read PDF format documents, you can download a free PDF Reader from www.adobe.com. The questions on the midterm will be similar to these sample questions, but will not be identical. Small changes of wording can change the answer- on the exam, make sure you READ THE QUESTIONS CAREFULLY and TAKE YOUR TIME in answering them! The last 10 or so questions are from chapter 5. This material will be covered in lecture on 14 and 16 February. First exam Friday 18 February. Bring your OU identification. The exam will cover material in chapters 1 to 5 in book. DO look carefully at the 2-page graphics/text sections, such as pages 18-19, 34-35, 48-19. Many of the diagrams I showed in class are just slightly different versions of the diagrams in the book. Make sure you read all the text I have that goes along with the diagrams at observatory.ou.edu and study the diagrams. 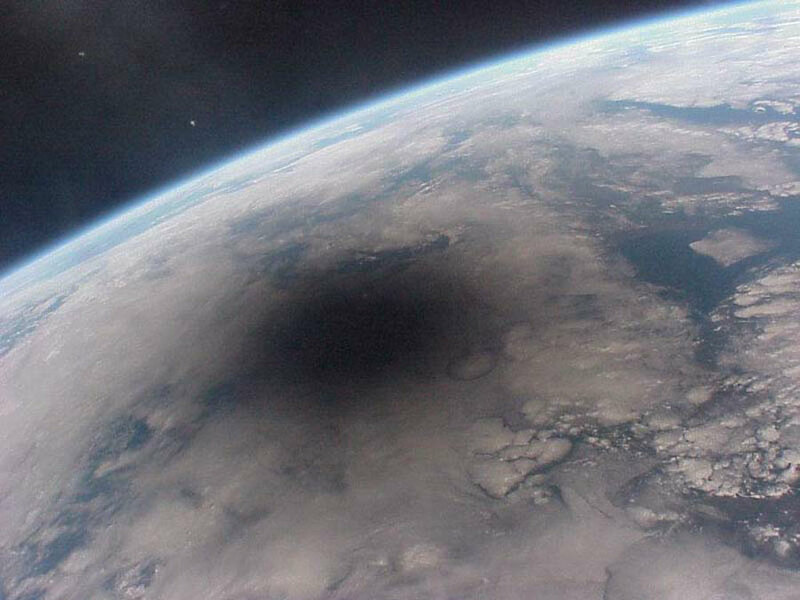 Solar eclipse from Earth orbit This image, taken from the Russian space station Mir in 1999, shows the Moon's shadow on the Earth during a solar eclipse. 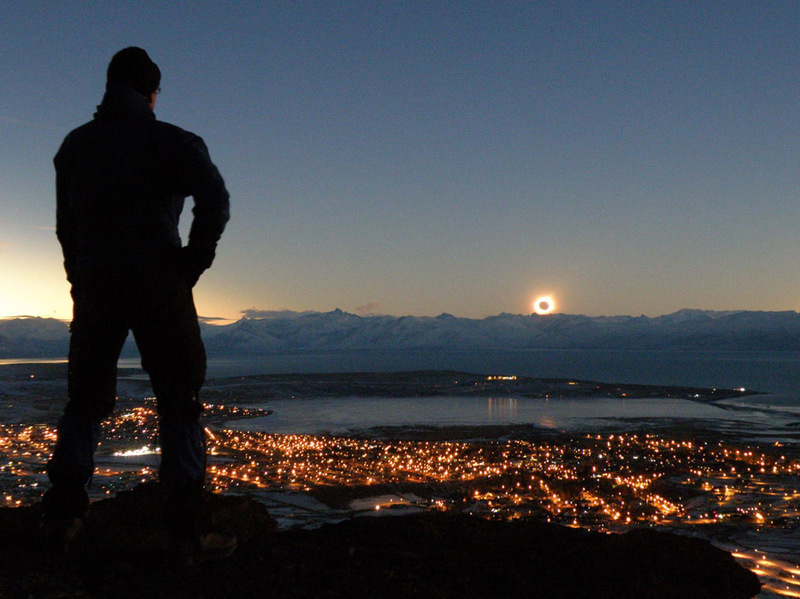 Compare this to the diagram of a solar exclipse of 24 January "Solar and Lunar Eclipses". 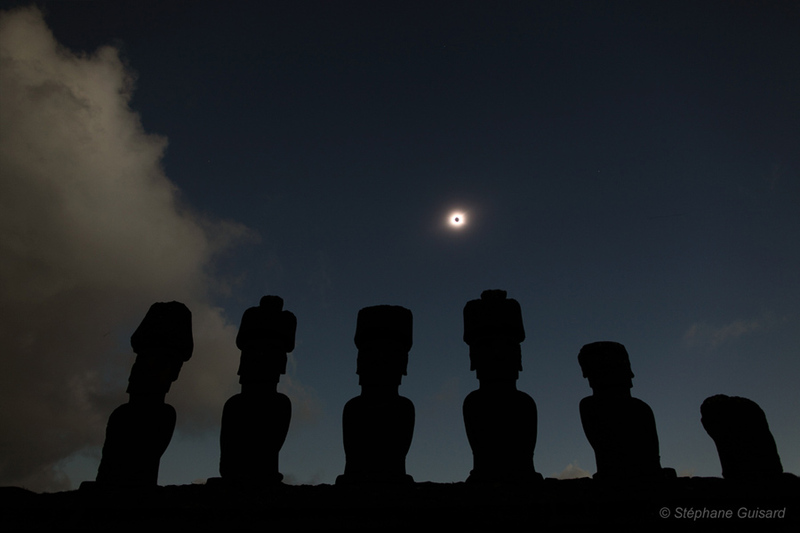 Eclipse and Moai The Moai are the famous stone statues of Easter Island. Isaac Newton, born about the time that Galileo died, surely ranks as one of the top handful of scientists of the last 500 years. Newton was able to give a good explanation of the motion of the planets, indeed the motion of all bodies. 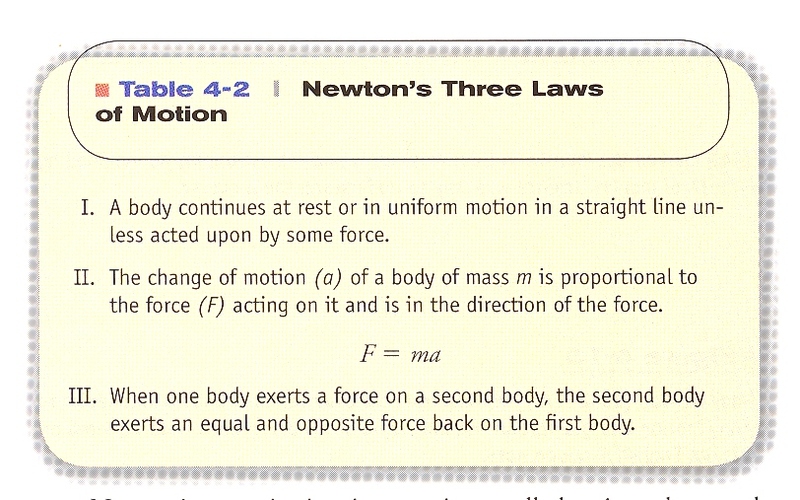 Newton's 3 Laws of Motion These 3 laws govern the motion of all objects. At first, the laws might seem to contradict common sense. For example, from the 1st law, you might think that an automobile would continue to move at constant speed on a flat road if you turned the engine off. Of course, if you tried this, your car would slowly lose sped and stop. Does this make Law 1 wrong? No way! What is going on is that there are frictional forces- air resistance and friction in tires and wheel bearings- that acts to slow you down. 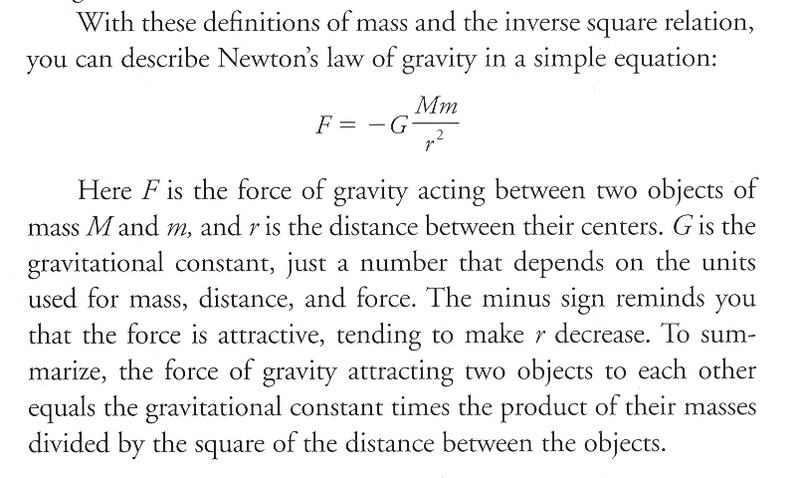 Force due to gravity The strength of the force of gravity (always a pull) between 2 objects is given by this equation. The distance (r) is on the bottom, so that force gets smaller as the distance gets larger- makes sense. Newton's Laws of Motion state the relationship between motion and changes in motion, and the forces (push or pull) that a body experiences. When coupled with Newton's Law of Gravity, which gives a quantitative value of the pull felt between two objects, we can understand in great detail to motion of the bodies in the solar system. We can understand why Kepler's 3 Laws of Planetary Motion work, rather than just saying "thats the way things are". Newton's orbital thought experiment. Imagine shooting a cannonball from a cannon parallel to the surface of the Earth from a high mountain. The faster the cannonball moves, the further it would travel before hitting the Earth. At a certain speed, the cannonball would fall around the curving Earth, and would come back and hit the cannon. Such a path is called an *orbit*. If the cannonball were above the Earths atmosphere, so that there was no friction with the air, it would just go around and around forever. The cannonball is in "free fall"- it is falling around the Earth- but it never gets any closer to the surface! The cannonball (or Space Shuttle or whatever) does not need any further "push" once it gets into an orbit. A simple way to think about what is going on is to think about tying a string around a rock and swinging it around in a circle. The string exerts a force on the rock which causes it to keep moving in the circle, rather than in a straight line. (If the string breaks, the rock flies off in a stright line.) In an orbit, *gravity* provides the "string" that holds the orbiting body in place. So, a body in an orbit is constantly being pulled by gravity into a curved path. By Newton's first law, a curved path requires a force- if there were no force then the object would move in a straight line. Weight is the the force you feel of the Earth pushing up on you as you push on the Earth due to the gravitational attraction between you and the Earth. (Weight and mass - the amount of "stuff" in a body - are not the same.) If you are falling, you have no weight. Astronauts orbiting the Earth experience weightlessness as they are in a continuous free fall. You have probably all seen videos of astronauts floating around inside the space shuttle. 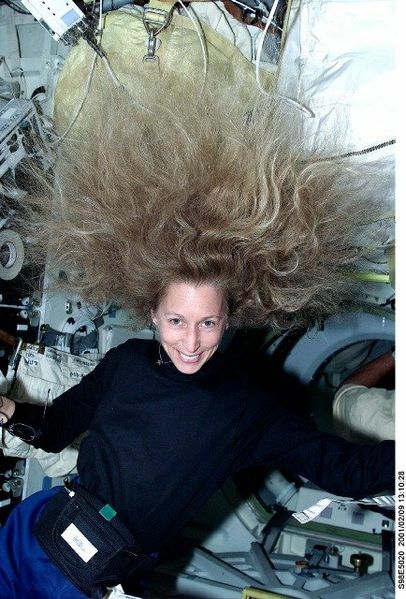 Bad hair day Astronaut Marsha Ivins demonstrates the effect of weightlessness on long hair while on the Space Shuttle. Using Newton's ideas, we can explain Keplers 3rd law, which relates the period of revolution and distance of a planet from the Sun. Indeed, using Newton's ideas we can generalize Kepler's 3rd Law to calculate the period of any two orbiting bodies- for example the Space Shuttle orbiting the Earth. The time to complete one orbit (orbital period) depends on the masses of the bodies and the distance between them. From period and distance one can calculate speed of the body. For example, we can calculate that it takes about 90 minutes to orbit the Earth once in a low Earth orbit (a few hundred miles above surface). The speed in such an orbit is about 18,000 mph, approximately 30 times the speed of an airliner. 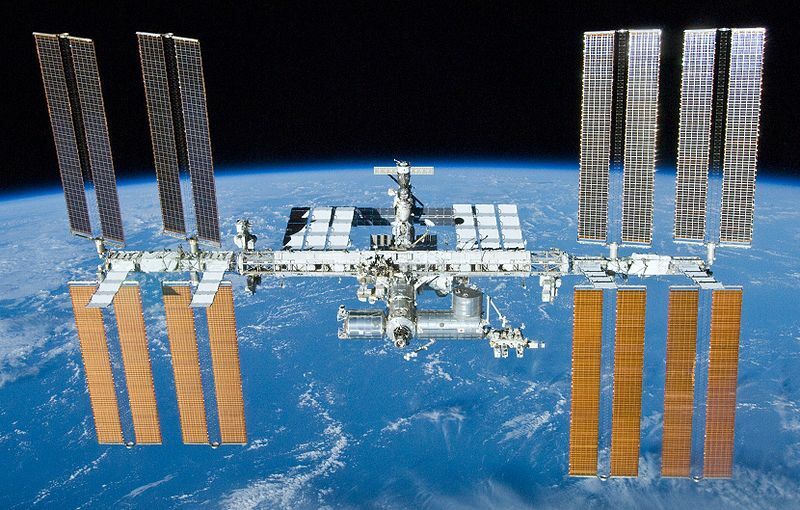 The Space Shuttle and the ISS (International Space Station) are examples of objects in such a low Earth orbit and so each takes about 90 minutes to circle the globe once. Low Earth Orbit to scale with Earth This shows a low earth orbit, such as that followed by the Space Shuttle or ISS, in scale to the Earth. The orbit is about 250 miles above the surface. 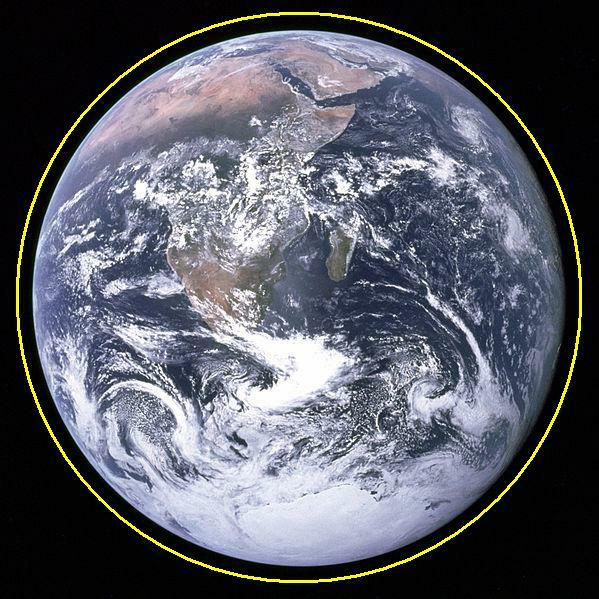 This distance is only about 3% of the diameter of the Earth. Get a window seat! 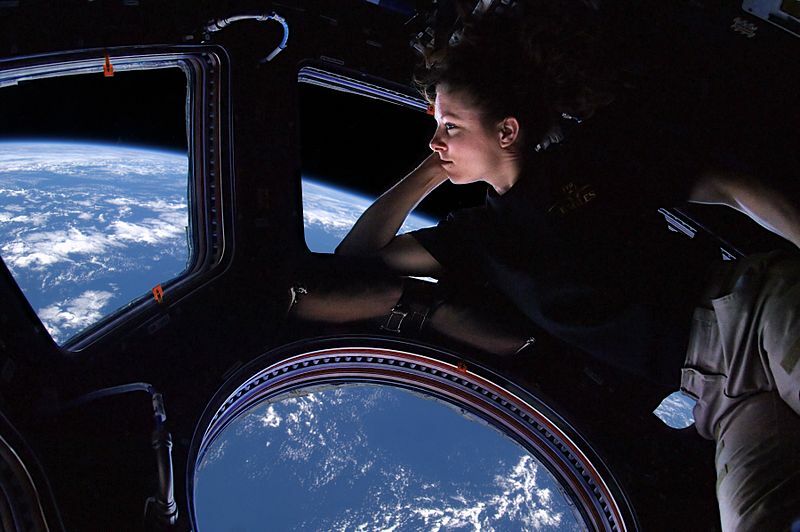 Astronaut Tracy Caldwell Dyson views her (and probably your) Home Planet out the window of the ISS. Next time your travel plans involve space travel, make sure you reserve a window seat! From Newtons generalization of Keplers 3rd Law, you can see that the further two bodies are apart the longer the period of the orbit. So larger orbits mean longer orbital periods and also slower orbital speeds. One excellent example of a practical use of this is to calculate the distance where a satellite will orbit the Earth every 24 hours- or a geosynchronous orbit. 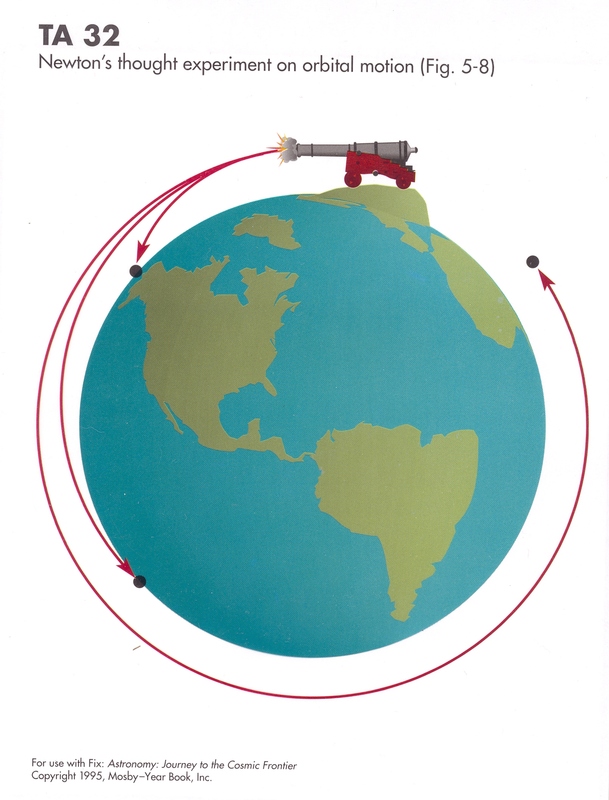 Geosynchronous satellite orbit. A geosynch orbit is one in the Earths equatorial plane at a distance from Earth (determined from Newtons generalization of Kepler's 3rd law) where the period of revolution is 24 hours, or one day. At this special distance from Earth, a satellite completes one revolution each day, so (from Earth) it appears to be fixed in the sky- it does not rise and set. The satellite and Earth turn at the same angular rate, each completing one "turn" each day. 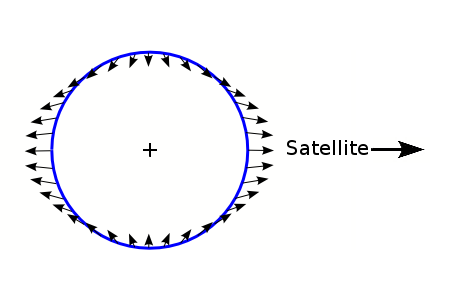 The image shows 3 typical satellites at geosynch orbit. The view is tilted - the actual orbits are circular. Note that (unlike many diagrams I use) the size of the orbit is TO SCALE with the size of the Earth. Because the satellite appears at a fixed spot in the sky, you can point a satellite dish (antenna) to that spot and always be pointed at the satellite. Thus, many communication satellites and broadcasting satellites are located at geosynch. Famous science fiction author Arthur C. Clarke was the first to suggest the use of this orbit for communications satellites (back in the 1940s!!) and so this region of space is sometimes called the "Clarke Belt". Geosynchronous satellite.. This is a diagram where the size of the Earth and the distance to the sateliite are to scale (the stick figure person is NOT to scale!). This shows why satellite dishes point south of the equator (in the northern hemisphere). Newton used his ideas to finally explain the tides. Tides had of course been noted by humans since ancient times, but there had never been any explanation of them until Newton came along. Tidal force The gravity of one body pulling on another will try to pull the body into an elliptical shape. This is due to the fact that the nearer part of the body is closer to the other body. The amount of the force pulling the body away from a spherical shape depends of the difference in the force of gravity from one side of the body to the other. When the Moon and Sun pull on the Earth, the oceans stretch very slightly into an elliptical shaped blob. The long ends of the "blob" extend towards and away from the Moon (and to a lesser extent the Sun). As the Earth rotates, the "high part of the blob" runs into the ocean shore and causes a rise and fall of the water level- the tides. Spring and neap tides.. 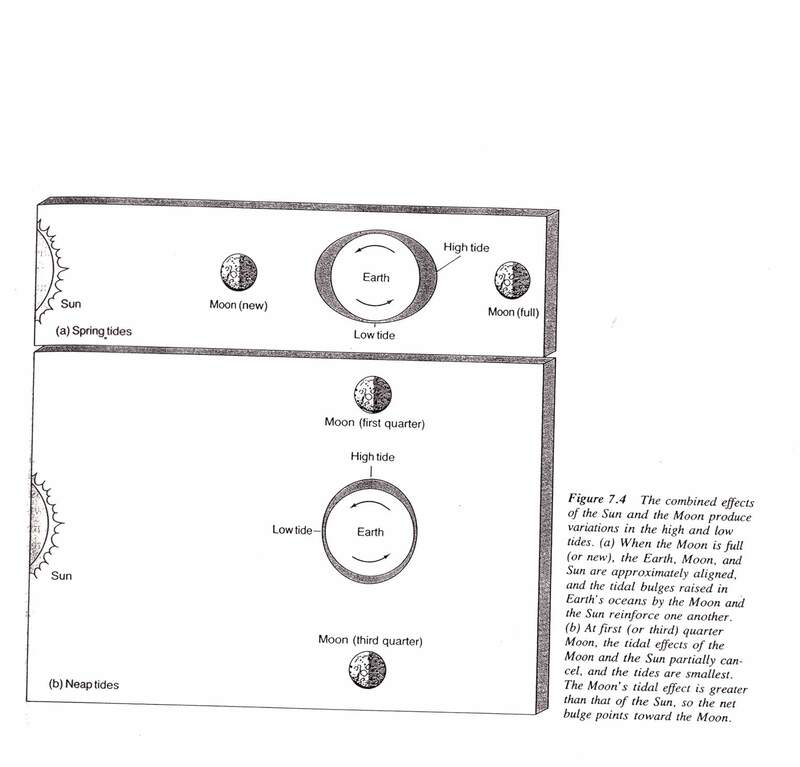 Both the Sun and Moon exert a tidal influence on Earth. When the Sun, Moon and Earth are in a line, near the times of new and full Moons, the tidal bulges of the Sun and Moon lie in the same direction, and they reinforce each other. This results in a tidal range larger than average and is known as a "spring tide" (but it has nothing to do with seasons!). 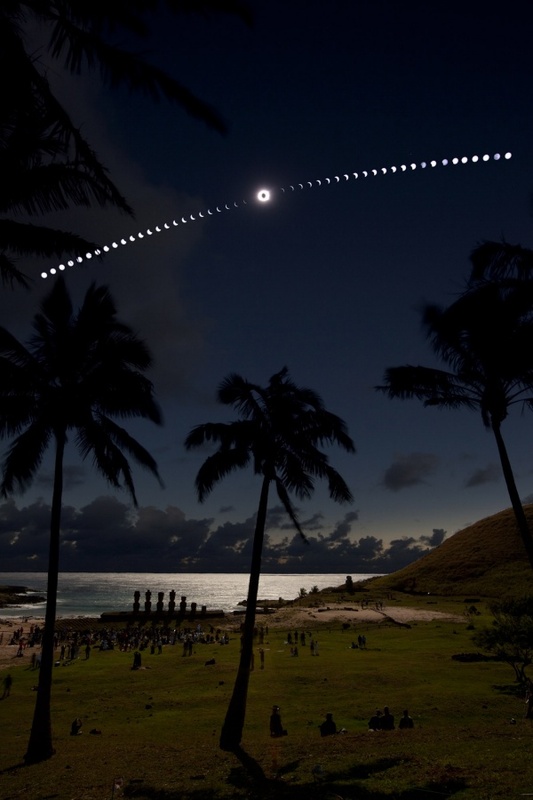 When the Moon is perpendicular to the Sun-Earth line (near quarter moon phases) then the tides are lower than usual, as the Sun tidal bulge partially "fills in" the lunar tidal bulge. But the high tide points to the Moon, as the lunar bulge is larger than the solar bulge. This configuration is called a "neap tide". Tidal bulge. 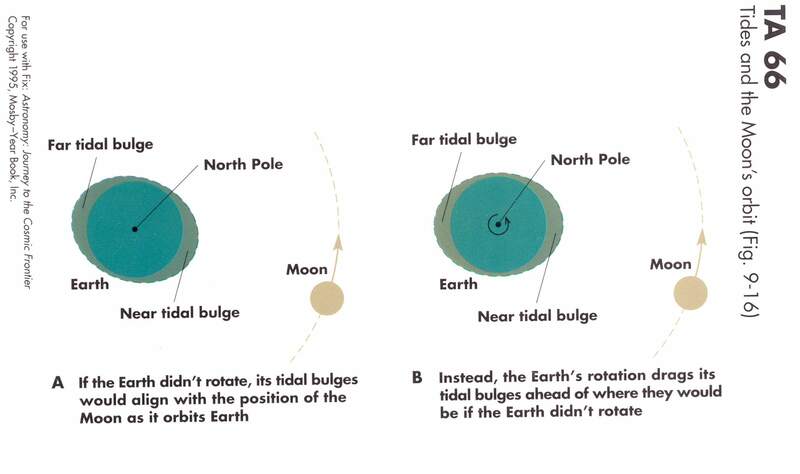 The tidal bulge is dragged around by rotation of Earth, so that it "leads" the Moon slightly. This has all sorts of interesting results, including lengthening of the Earths day and lengthening of the orbital period of the Moon around the Earth. But these effects are very slow, and not something that you would notice over a human lifetime, without precision measurements. Tides in Bay of Fundy.. 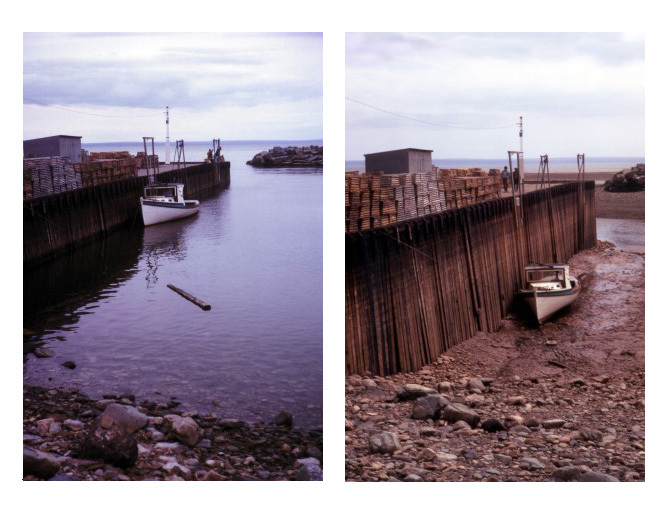 These pictures show high and low tide in the Bay of Fundy, Nova Scotia, Canada. In the open ocean, the tidal range (difference in water level between high and low tides) is about a half a meter to a meter. Near the coast, coastal features such as bays and inlets can act to "funnel" the tidal rise and fall and greatly amplify the tidal range in certain locales. Under certain conditions, the tidal range in parts of the Bay of Fundy can be over 16 meters (52 feet! ).